GT Jersey on sale now. Order at the Golden-Triangle-Store under the Events Tab at the top of this page. 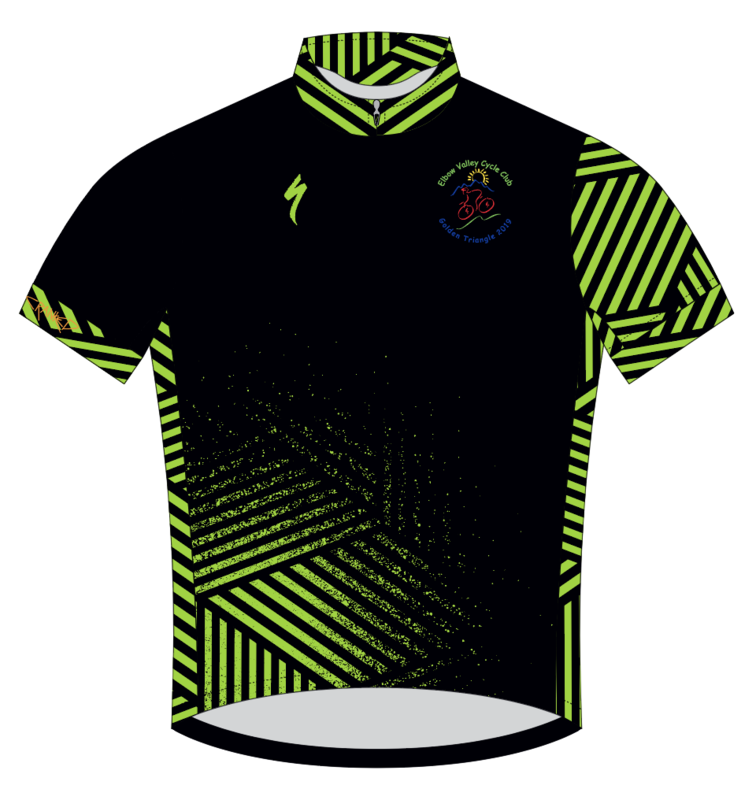 Deadline for ordering jerseys is April 11. Order yours today. Banff National Park is the heart of the Canadian Rocky Mountains World Heritage Site. A global treasure of natural beauty, wilderness and diversity of life. It is a place to experience the awe-inspiring forces that have shaped mountain landscapes and wildlife over unimaginable time. The Golden Triangle is a three-day bicycle tour in mountainous terrain. It follows a clockwise route consisting of three approximately equal distance days. The Golden Triangle is not an endurance contest nor a race. It is purely a recreational and social event. It is intended that all participants in the Golden Triangle will ride safely and cooperatively. The Triangle is one of many annual ‘Classic’ bicycle tours organized by the Elbow Valley Cycle Club. On Friday morning the tour registration will open at 7:45 AM and close at 9:00 AM. Ride the tour at your own pace. Slower riders should keep in mind how far they have to go before nightfall each day. Faster riders should note when food stops open. The GT is not a race. Click on the link below to see day by day mileage, elevation, lunch and snack stops. SPECIAL ADDITION; click on the link below for downloadable maps with turn by turn directions for each day. This link will give you directions on how to download the Ride With GPS app onto your phone and then download the GT 2019 map with turn by turn directions as well as letting you know when you're getting close to the food stops and the halls in Radium and Golden. This tour, as in any EVCC Classic tour, is only open to members. In order to ride the Golden Triangle you must either have or apply for a 2019 membership. (Note, if you apply for a membership, please wait till the next day to register for the GT for your membership to be processed) Anyone younger than 18 years of age on or before May 24, 2019 will have to be accompanied by a parent or legal guardian. Only one rider under 18 years of age per parent or legal guardian will be allowed. The fee includes all food, transportation of your luggage and camping sites at Golden and Radium. It does not include EVCC membership. For those of you who would like to register before ride day, there will be a pre-ride registration night on May 21, 2019, between 6 – 9 pm at Parkdale Nifty Fifties, 3512 5 Ave NW where you can pick up your registration information and luggage tags. On ride day you just drop off your bags and go! Ride day (May 24th) Golden Triangle’s registration starts at 7:45 AM from the Castle Mountain Junction Gravel Pit located 26 km west of Banff near the junction of Hwy 1A and Hwy 93. Registration closes at 9:00 AM SHARP. The baggage trucks will be available for loading at the start of registration. Riders return to the gravel pit after completing the 320 km tour. Parking is limited at Castle Junction where the tour starts. It is a working area for Parks Canada but we park, with permission, according to space available. DO NOT park in the Castle Mountain Bungalows or Service Station areas as your vehicle might not be there when you return. You MUST obtain a PARKS CANADA VISITORS PERMIT for your car. Please note – there is NO CAMPING in the gravel pit. Please try to car pool to fill any spare room in your vehicle. People needing a ride or willing to offer a ride are asked to email evccgt@gmail.comand put CAR POOLING in the heading. We will try to match up some folks. Or, if you know others who are participating, try to work together to reduce the number of cars brought to the trail head. All vehicles will be given a GT Parking window ticket as a part of your registration. All potential participants are reminded that they should not attempt to ride the Golden Triangle unless they are certain that they are capable of riding the full 320 km. To enjoy the ride fully, the Golden Triangle should not be your first long ride of the season. Remember, you will be climbing several major mountain passes so be in good physical shape. Join the GT Training rides each Sunday or any of the EVCC day trips in the weeks before the GT with at least one 100 km+ ride completed before the Golden Triangle. For riders with serious problems, there will be limited support vehicle service. This will only be for those who need medical help or who have non- repairable bicycle trouble. Get your bike in good working order and don’t spoil your ride with a bike breakdown. Several bike shops offer early spring tune-up specials. Cranked and Ridleys have them for sure! See the GT News for further specials. We discourage riders from having a personal support vehicle as it causes congestion in the lunch/snack stops and along the road. But if you insist on having a friend or family member coming in a personal support vehicle, you MUST register that vehicle with the GT coordinator by sending an E-mail to evccgt@gmail.com. If your support people expect to eat the meals please order meals for them through the GT Events page on the website. There is an additional charge for snacks and lunches which will be charged upon support vehicle registration. · Day packs, backpacks without frames, panniers, or other soft baggage. · Bags over35 lbs will be refused. · A second bag for hotel delivery will be allowed for a fee of $20 (paid when loading bags at registration) and the limit on both bags is 35 lbs/bag. · Two bags will be allowed for camping participants but the weight still has to comply with the 35 lbs/bag. Remember that fellow cyclists help to load your camping bags. · If you camp in Radium and hotel in Golden, you will not be charged for the extra bag. · If you have some other arrangement in Radium for a place to stay and will be moving your own luggage, please indicate Camping and then you can pick your luggage up at the campgrounds in Radium and/or Golden. · Items which riders wish to have with them enroute must be carried on their bicycles. All baggage on the luggage truck will be unavailable until the day’s destination is reached. · Exact locations for drop off of luggage will be given in the registration package. 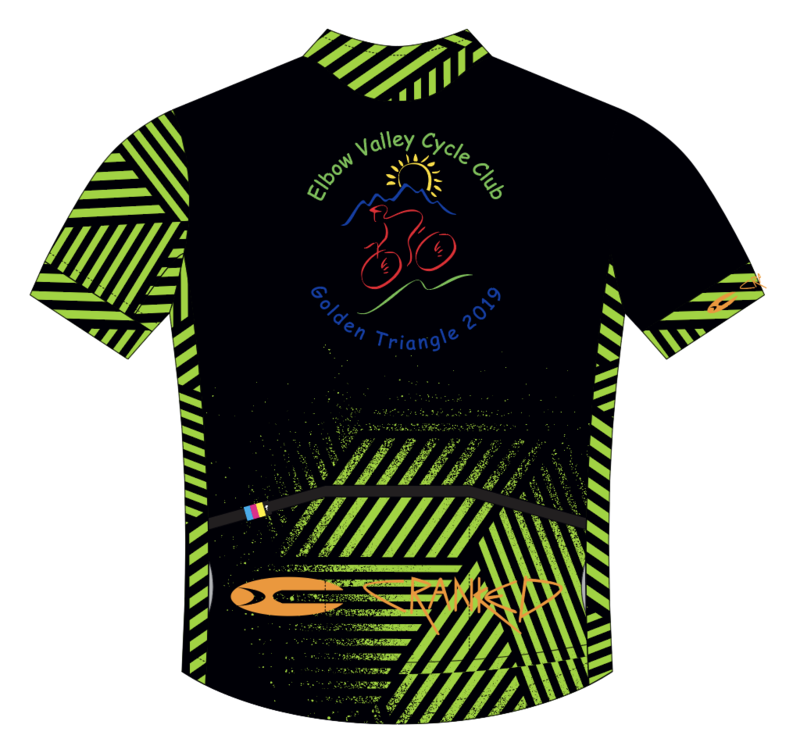 · The Golden Triangle Tour Committee, Volunteers, and the EVCC cannot be responsible for any unidentified baggage. · Be kind to the volunteers (and other cyclists) handling the luggage by abiding by the weight limits. KEEP IT LIGHT AND TIGHT! Although a bike mechanic will accompany the ride, each rider is expected to have basic tools and be capable of making simple repairs. Carry tools, spare tubes, a patch kit, and a pump. It is stressed that this tour is for the PREPARED cyclist. Stock parts carried by mechanic are very generic and are provided at competitive prices. First aid kits will be available in most support vehicles. Emergency medical assistance can be summoned via radio from any support vehicle. Please note that the volunteer first aiders cannot dispense medication (eg. Aspirin). Please bring your own medication. Make sure you bring clothing for all weather conditions. Especially required are wind jacket, fleece top, tights, full finger gloves and rain gear. Feet and hands are especially vulnerable. If you don’t have rain booties, bring plastic bags and elastics. You may experience snow one day and require sun block the next. Remember you will be cycling the Rockies with an unpredictable mountain climate so bring clothing for snow, rain, and sunshine. If you plan to visit the Radium Hot Springs on your way down to Radium on Saturday be sure to carry your swim suit with you on your bike. Access to baggage will only be available at the baseball diamond after 1:00 pm. Some people carry a swim suit with them on day one and then stop for a break at the pool. It’s about 2 km downhill from the pool to Radium. No showers are available at the camping area in Radium. There will be shuttles to the Hot Springs from 3:30 p.m. to 9:30 p.m. compliments of the volunteers. Friday breakfast before the tour is not provided. There are food stops every 30-40 km. If you are out of shape or get a late start, you may arrive after the food stops have closed. If you ride ahead of the pack, you may get to food stops before they are open (food stop schedule provided in registration material). In order to reduce the volume of trash that we create, we encourage you to bring your own cup, plate and utensils for snacks and lunches. We are working towards Zero Waste by recycling or composting and minimizing plastic and other waste. We accommodate vegetarians in our group meal plan. If you have critical needs/allergies email the coordinator and discuss evccgt@gmail.com Bring one or two water bottles to quench your thirst between stops. Water will be available at the food stops to refill your bottles. Dinner Friday and Breakfast Saturday will be at the new Radium Hall, next to the camping area/ball diamond. Dinner Saturday and Breakfast Sunday will be served at the Mount 7 Rec Plex at 1310 9th St South in Golden. A Roast Chicken Buffet will be served on Friday night and a Roast Beefg Buffet will be served on Saturday night. Both breakfasts are a hot buffet. There will be a bar, serving beer and wine, in both Radium and Golden. Approved helmets are mandatory and brightly colored clothing is highly recommended to increase visibility. When traffic is approaching, please show courtesy by keeping to the right. Drafting (riding in a close single file) is not recommended. Most Golden Triangle accidents in the past have been caused by inattentive drafting. Safety is of prime concern on this tour – know your limits. If EVCC cancels the Golden Triangle registrants will receive all funds paid except those required by the administrative process in organizing the Golden Triangle. The EVCC membership is not refundable. If the tour is cancelled during the Ride Weekend (May 24-26, 2019) no refund will be provided. If registrants have to cancel for exceptional reasons (illness or family emergency), you may apply for a refund by emailing the Ride Coordinator at evccgt@gmail.com. Refunds will be issued on a case by case basis. All participants are responsible for any unexpected expenses that may arise from events such as weather delays, transportation problems or emergency costs. Luggage delivery will be done to the following hotels/motels in Radium Hot Springs and Golden. If you are not camping and do not require luggage delivery by volunteers (you have family or friends taking your luggage), your luggage will be delivered to the campground. To update your camping or hotel information please contact the coordinator at evccgt@gmail.com and in the subject line put ACCOMMODATION CHANGE. Your hotel information has to be correct to have your luggage delivered to the correct hotel. Please remember that volunteers deliver your luggage when you are packing for this event and they have been instructed to not load bags over the 35 lbs limit. Some hotels are on or near Highway #1 which means you have to cycle up a hill to get there. The dinner and breakfast are in the downtown part of Golden which means that you have to cycle down to the meals and back up the hill for the night after dinner or to leave town in the morning after breakfast. Taxis are available in Golden to come from hotels on highway #1 to the meals, if necessary. Cranked, in Airdrie is offering a pre-GT tune up for just $50.00 which includes, Deraileur adjustment, Brake adjustment, Safety check, Clean and lube drive train, On bike wheel truing, Deraileur hanger adjustment and Light frame and wheel wash. They have also arranged for Specialized riders to join us. (see upcoming "GT News" and check out the raffle bike details below. Ridleys too has some special prices for GT registrants. Use promo code for 15% off parts, accessories and apparel and 5% off electronics. An early bird special of 10% of new regular priced bikes. Bring proof of registration (on your phone is okay). Our S-Works Tarmac might be the perfect bike for winning a Grand Tour, but chances are, you're not going to be competing in Southern France this season. 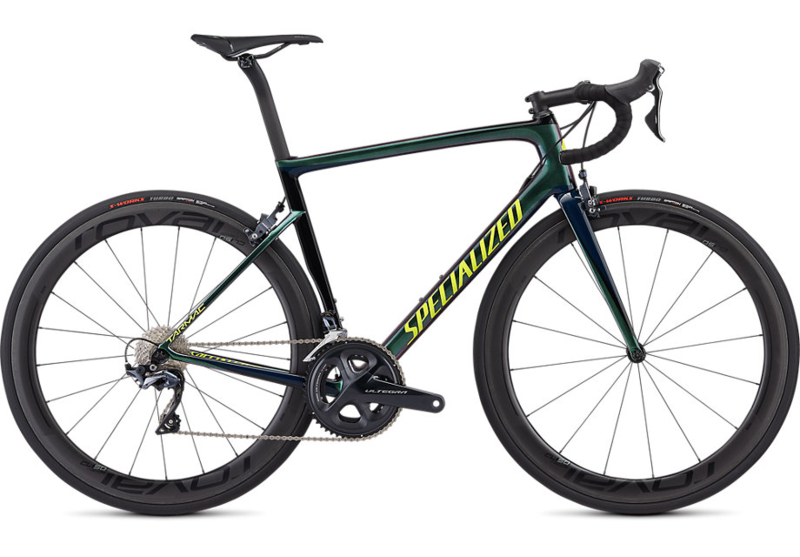 But when you need a bike that's ready to annihilate the competition on your training rides and local races, the new Tarmac Expert is pretty damn hard to beat. For the construction, we utilized advanced aerospace composite optimization software to revolutionize the construction and layup of our new FACT 10r carbon. It's the most advanced layup schedule we've ever made—the shape, schedule, and material optimization allowed us to shed nearly 200 grams. That's right, a 20% reduction in frame weight—the perfect recipe for your next PR. And while stiffness aids in the aforementioned, compliance must also be utilized for an optimal ride quality. That's why we designed a seatpost that builds compliance into the upper 120mm where clamping doesn't happen, dropped the seatstays, and altered the seat tube shape. We also added tire clearance up to 30mm, which translates to a 28mm Turbo Cotton on a Roval SLX 24 rim. This allows lower pressures for decreased rolling resistance, increased traction, and more comfort. Altogether, these additions still have the Tarmac riding like a true race-machine, but they just take a bit of the sting out of those road imperfections. You'll thank us on your next long ride. And while this is all great, we know that aerodynamics are the most important thing we can do to make you faster. Both our Bora-Hansgrohe and Quick-Step Floors Pro Tour riders, after all, are demanding aero improvements on every bike. With this, the aero goal was to discover where we could essentially "add aero for free," by not taking anything away from the hallmarks of the Tarmac design. During the six-month iterative process, three areas were discovered where we could do this—a new fork shape, dropped seatstays with aero tubes, and a D-shaped seatpost and seat tube. The result? A bike that's approximately 45 seconds faster over 40km compared to other lightweight bikes in the same category. This Tarmac comes ready to race out of the box, featuring a crisp Shimano Ultegra 8000 groupset, resplendent Roval CL 50 carbon wheelset, and a sublime Toupé Expert Gel saddle.